Still on the quest for the perfect Michelada and getting ready to host Cindy and Sue for dinner tonight to recreate our La Olla Oaxaca experience in the humble environs of my kitchen, I ventured out yesterday on Labor Day to the bustling metropolis of downtown Pittsboro, North Carolina, wondering if anything would be open. Perhaps Mexican immigrant shopkeepers don’t observe Labor Day, I hoped — just a normal Monday for them. Indeed, Don Pablo Mexican Tienda had their OPEN sign prominently displayed and the few cars on the mostly empty street were parked near the door. I love the small Mexican market shopping experience. Indeed, there was the Maggi (pronounce it with a hard G), the secret ingredient for successful Micheladas. I knew that somehow substituting soy sauce was just not going to make it. The taste test at home later that afternoon proved me right. I also found limes — big juicy ones — 7 for $1.00. Compare that price with your local major supermarket. Then, there were the ripe bananas, huge beautiful onions, avocados ready for guacamole that very day, and packages of 50 fresh tortillas for $1.25. I picked up the last papaya (it must have weighed 7 lbs) and could smell its succulence. I piled my goodies on the counter in handfulls. There were no shopping carts. You must like Mexican food, the proprietor commented. Yes, I said. I like Mexicans, too. Oh, that’s great, he said. Many people don’t want us here. I smiled and answered. Yes, I know. Cloth Fiber Workshop in Asheville, NC, will host a one evening natural dyeing workshop with Eric and Janet Chavez Santiago on Thursday, Oct. 2, 2008. The brother-sister team from Teotitlan del Valle, Oaxaca, Mexico, are fiber artists and rug weavers who color the wool of their rugs using only natural dyes from plant materials and the cochineal bug that grows on the prickly pear cactus. 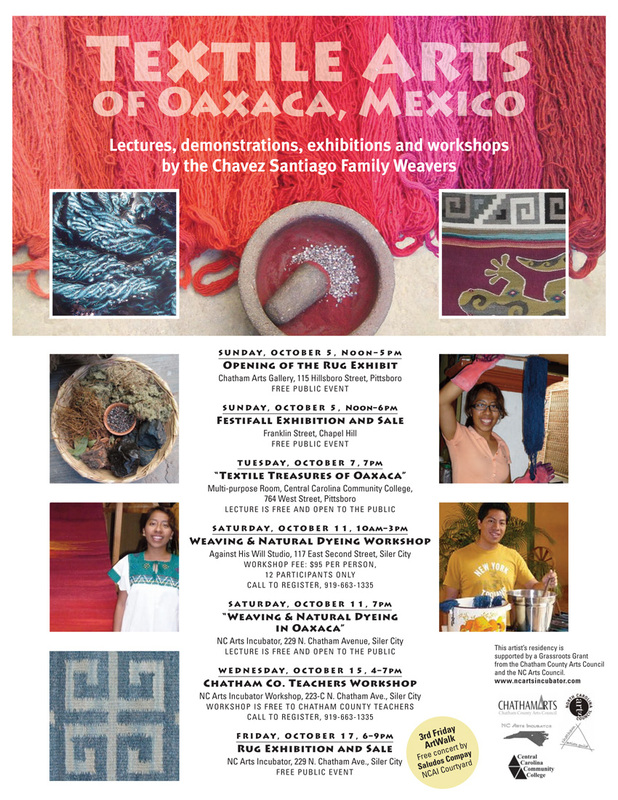 They will demonstrate ancient Zapotec traditional dyeing methods using cochineal, moss and indigo. Eric, who is the coordinator of educational services at the new Museo Textil de Oaxaca, the only museum in Mexico that is devoted exclusively to the exhibition and preservation of textiles, has developed recipes for over 95 different shades of cochineal and has recently been experimenting with dyeing on cotton and silk. Both Janet and Eric are fluent English-speakers. For a complete list of the Chavez family events in North Carolina, please click to see the blog post. If your organization is interested in hosting a one-day or one-evening workshop in NC during the month of October, please contact Norma Hawthorne.